Philosophy lecture Steve Duffin appears to have the dream teaching job if the tropical beach backdrop and iced drink in hand – as he addresses his students – are anything to go by. Bachelor of Arts students at Massey University doing his paper looked on the previous week as their lecturer tied sheets together before escaping through a third floor window and running off. Despite what the scene might suggest it was not a case of a desperate, overworked academic breaking out of his ivory tower, but a stunt for a video designed to make studying by distance more engaging. And it seems to be working, according to the culprits – philosophy lecturers Professor Bill Fish and Mr Steve Duffin, from the School of Humanities, who have integrated ventriloquism with a giraffe puppet, blues guitar, tai chi and more into their madcap series. Their videos and innovative online course material have been getting thousands of comments from students who can’t wait to see what antics the lecturers will get up to next. The pair put their creative, digital technology and acting skills to the test when they came up with the idea for the series for a new distance paper Tū Arohae: Critical Thinking, one of five new compulsory core papers in the Bachelor of Arts. (Tū Arohae translates as ‘to rend, or tear thinking apart’). “When it came to delivering this paper for distance, we totally re-imagined this course from the ground up,” says Professor Fish, who was keen to design something completely fresh and purpose-built to students who study alone, and not just provide lecture notes and an hour-long video from the internal course. “The idea was that students felt there was somebody real on the other end, and also that there is a friendly approach, not too serious,” says Mr Duffin. As the main protagonist with newly discovered comic flair, he fronts each of the 12 videos with a quirky introduction in which he is “interrupted” in his office, practising his guitar, playing cards, eating cake, hiding under a desk or playing with toy soldiers. A gimmick at first glance perhaps, the eccentric and entertaining videos – filmed by Chris Murray at Outpost – pave the way for the more serious substance of the course, presented and delivered via themed digital boxes with readings, short guest videos, comprehension exercises and quizzes as well as a space for online comments, discussion and questions. While the lecturers have avoided textbooks, students who complete a week’s material are rewarded with written files in an online library for revision and reference. Many have shared examples of how critical thinking and reasoning skills have helped them in everyday life, in conversations, disagreements and analysing media articles more astutely. “The level of engagement is light years ahead of anything we’ve had in the past,” says Professor Fish. Mr Duffin also weaves in the occasional motivational or empathetic comment – such as; “I know it’s hard working on your own, but hang in there!” – as the course progresses to acknowledge the pressures and realities of the distance students’ lives, many of whom are also working, parenting or care-giving. One student told them on the comments space she was moved to tears of appreciation at these comments. “They feel we understand, that we’re working with them,” says Mr Duffin. As well as filming with green screens to enable them to add animation into the short teaching videos, the lecturers have also invited academics from other humanities and social sciences disciplines to take part in the series. This multi-disciplinary approach exposes students to a wide range of subjects, and enables them to understand how critical thinking is applied across different fields. “We’ve set out to not only build the best critical thinking paper we can build that really embraces the idea of interdisciplinary learning, but also to show what can be done with time, technology and starting afresh,” says Professor Fish, an internationally renowned philosopher of perception who has spent many hours writing storyboards, scripts and HTML coding over the past year. Their course material, they say, shows how teaching intellectually demanding topics can co-exist with humour and fun. Hence, the weekly teaching material titles evolve from The Structure of Reasoning (about how the different elements in a piece of reasoning hang together to make a case for a particular claim) and Frames and Perspectives (how people with different perspectives on a piece of reasoning can see it and evaluate it quite differently) to the The Truth Will Set You Free and The End of the Road. The end of the series was not quite the end, despite clever camera work in shooting Mr Duffin’s Houdini-esqueescape. “We had so many comments from students saying they were really going to miss the videos,” Professor Fish says. 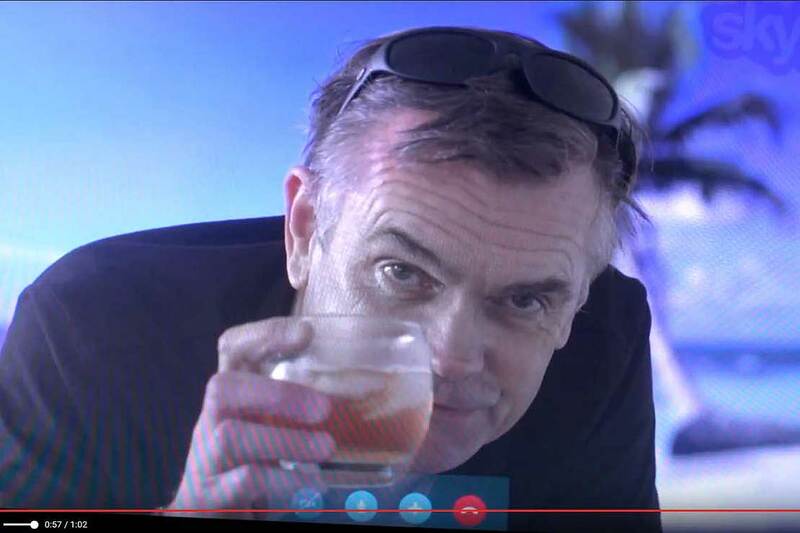 So they applied their newly honed cinematic skills and mocked up a scene for a farewell video using stacked tables and a computer screen image of a tropical beach with Dr Duffin lying in front. “Well, here I am, free, and able to relax at last. … cheers!” he quips. They aim to make the video series available in the future on YouTube, and can see the potential for a condensed version for professionals in a variety of occupations where critical thinking skills are vital.